This is not easy. It is a project brought about by a promise I made to an old friend, Hubert Peitzmeier, with whom I have flown. He says I may have a message that some would be interested in hearing. Well, that may be, until now I never thought so, but maybe. So here goes. It starts in Phoenix Arizona, where I was a member of the Arizona Air National Guard. I was assigned as an aviation mechanic and crew chief, where I enlisted in April of 1954. I had decided to join the Guard while still in high school. I completed basic training in Phoenix and served as a flight line aircraft mechanic working on the P-51's we had at the time. My job involved re-fueling the aircraft when they returned, and making them ready for flight. As an engine mechanic I was also assigned the duty to change their sparkplugs when, after a flight, the pilots write-up mentioned a large magneto drop. In the hangar I adjusted the valves on the Allison engine, a job not unlike the valve adjustment of a Chevrolet. As time went on, the 51's went away and were replaced by F-86A's. As it turned out, I became a member of one of the engine change teams we had at the time. I enjoyed very much the opportunity to shorten the time required to replace an F-86 engine and make the aircraft ready for flight line maintenance chiefs to check our work and run up the newly installed engine. Our follow on job then would be to install the aft fuselage section and make the Saber ready for its test flight. In the course of this work, I was also working on getting my private pilots license as a student of the Phoenix Flying School, a part of Phoenix College. One of my flight line sergeants, Ensey Viges thought I should interview for one of the possible flight school training slots that were being made available. Not many of the enlisted folks, I was at the time an airman first class, were offered such an opportunity and I was especially pleased for the chance. As it turned out, following numerous tests, I was selected and in November 1956, I entered USAF pilot training class 58-I-02, as an Aviation Cadet. I started at Lackland AFB Texas, in November 1956. During the course of training, I was assigned to Graham Air Base, Marianna Florida, where I flew the T-34 and T-28 and Greenville AFB, Mississippi, where I flew the T-33. Upon graduation and subsequent completion of F-86D training at Perrin AFB, Texas, I was re-assigned to the Arizona ANG at Phoenix. In March of 1958, I was assigned to the 197th Fighter Interceptor Squadron which flew the F-86L. As a guard pilot I was regularly scheduled for alert duty and was frequently 'scrambled' as a part of the USAF Air Defense Command. About that time we heard a noise that we had never heard before. With its distinctive howl, except maybe for a hunter who had experienced a lonely wolf in the White Mountains, the J-79 equipped F-104 was coming to Phoenix. Well, we began training in earnest. Ground school started in Phoenix but also temporary duty at George AFB California for systems training was part of the program. And then back to Phoenix as the aircraft began to arrive. Not all was smooth as one of the first to arrive blew two tires. Another, a B model with one of USAF pilots aboard, came in too low over the overrun and caught the cable of the chain link fence with one leg of the main landing gear. As he started a go-around the cable just pulled the right main landing gear leg out of the bottom of the airplane. The subsequent two gear landing at nearby Luke AFB was not uneventful as the airplane departed the hard surface of the runway and skidded out into the gravel. Although repairable, it was a long time before that B was flyable again. And then it was my turn. I was to fly a B ride for checkout with LtCol Phillip Rand, our USAF advisor. We briefed, pre-flighted, strapped in, and I signaled for the ground turbine compressor to start. With the GPU up to speed, I raised one of the ignition switches and the air hose inflated. As engine RPM came up, I opened the throttle to idle at 10-12%, and signaled one finger to the crew chief. As RPM continued to increase, the now familiar rumble of combustion occurred and EGT began to rise. Twenty percent, two fingers, thirty percent, three fingers, and at forty percent, four fingers. I watched the GPU air hose deflate. As the engine continued to accelerate to idle, it seemed the whole machine had come to life. It was not a vibration but more like a tone. A low frequency pulse was felt through the downward ejection seat as the generators came on line and radios began to work. After all the checks, taxi to the runway, canopy closed and ejection seat pins removed, we took runway 8 for departure. Engine checks all normal, brake release, then afterburner. Acceleration was fantastic! After being accustomed to the acceleration rate of the heavy F-86-L, this was a ride on a rocket! Our departure was to the east and Col. Rand had suggested we make an afterburner climb to 35000 ft. Well it was a ride to never forget! A clean B model, in AB, nose up but still unable to keep the airspeed at 400. Rand said it was Ok for the speed to go to 450 for an AB climb. I really tried and as best as I could but airspeed was only in the vicinity. But it didn't make any difference 'cause all of a sudden here was point nine Mach. I just held onto that as all of a sudden here was Flight level 350. It couldn't have been much over two minutes and here we were already! So now it was time to solve the pitch trim as our acceleration was already pushing us above Mach one. I tried so hard to keep us level and probably never did completely stop the altimeter when Col Rand suggested a bit of nose down trim. It seemed to work as the machine seemed to begin to groan as the Mach meter just raced around the instrument. At 1.7 or maybe 1.8 Mach, T-2 reset started and the engine RPM increased to 104%. Actually, even more acceleration was easily felt. Here came Mach two and immediately Col. Rand said now let's start a slow climbing turn and slowly come out of afterburner. I started the turn, and as I retarded the throttle, the entire cockpit filled with FOG! I thought explosive decompression, and it was, but it was caused by a Flame-out! We had flamed out! First ride in the airplane and I had broken it! Col. Rand said, "Keep the turn going! Back towards Phoenix"! Well, I tried but as I felt him shake the stick, I knew he wanted control. So I just sat back and let him fly. It seems the fog was beginning to go away and I was able to see the instruments again. I certainly could now see the RPM going down to 40%. I do not recall if we had interphone during all of this but I do recall the RPM just did not want to come back up, no matter how often I hit the starter switches. As a matter of fact, the EGT was also on the bottom of the gage. I do not recall our descent back to Sky Harbor save for the part when the engine finally started and the RPM again began to follow the throttle. Col Rand gave me back the airplane and I flew a straight in approach to the runway. It was a takeoff flap approach since we had had engine problems. Yep, I landed the machine, used the drag chute to help stop, taxied back and shut down. Guess what, as maintenance lowered the electric access panel, all four boost pump switches were OFF! We had taken off, climbed, gone to altitude, reached Mach two and as long as I never moved the throttle, the J-79 just kept running fine! As soon as the throttle was retarded, with no boost pressure, it just ran out of fuel. Well, since I only got one landing that day, I was scheduled for another B model ride before I could solo. Solo came soon as we were already hearing rumors of having to go on active duty soon. We didn't know where, but as Guardsmen, we were always subject to being called up if the Active folks needed us. As it turned out, we started making plans for Germany. At first we thought we would just fly to Ramstein AB, and we started making a lot of four tank rides around the Arizona desert just to see how far we could go and how many hops it would take to get us there. But it was not to be. Caution said there were too many possible problems hopping across the Atlantic. So we were not surprised to see the C-124 Globemasters begin to arrive. Lots of activity was apparent as wings were removed, tails taken apart, and fighters being pushed into the giant swinging doors of the transport. Proficiency flying suffered a bit as we were all trying to stay current with the T-33, hardly a craft to keep one sharp enough for the F-104. But as the summer days became fall we finished all the going away parties and got on board. My ride to Germany was in a C-54. Actually I was happy cause just the day before I had seen a C-124 Globemaster make three attempts to take-off. He had aborted each time for some reason. Finally, with his departure, I knew it was serious. Arrival in Germany was filled with reassembly of fighters, running over perfectly good horizontal stabilizers with fork lift trucks and getting bedded down in ancient quarters equipped with steam heat. As aircraft became ready, the German weather would not give us our minimums we needed for our first rides. So we sat. It was probably good for our maintenance guys as they had extra time to fine tune the machines for the day the weather would permit flying. And fly we did, only to be met one morning by a picture of our first bird, on its first flight, on final approach, gear and flaps down right there in the gunsight of a Canadian Saber. The photo, taken from gun camera film, was posted on our Squadrons front door. And so we were welcomed to Germany. But we were not prepared for the lower temperatures, icy taxi ways, (engage nose wheel steering, turn right to park, and watch as the aircraft continued straight ahead). But we learned to take it easy. Engines had other problems as compressor corrosion, or other problems made engine stalls and subsequent high speed landings all too frequent. And then there were other problems with tire failures and the lack of a tail hook on the A model to catch a barrier cable to help get stopped. One takeoff turned into a disaster when Jim Floor decided to stop, after a right main gear tire burst. His early braking attempts only got the wheel ground down to a flat spot and when he crossed the Barrier cable, it caused the fighter to turn right and go up the high speed taxi way into the F-102 alert facility. Of course he got it stopped, but the pylon tank had been dragging on the ground for long enough to cause a fuel leak. This caused fuel to run into the hot wheel and brake assembly and fire was immediate. As he opened the canopy he was immediately met with flames coming in from the right side. So he closed the canopy, jettisoned it and then was able to exit the airplane to the left side. Naturally, he came to an abrupt stop when, at the end of the dingy lanyard, he was jerked backwards. But he finally unhooked the lanyard and got away only to see the arrival of the fire trucks. That was good, he thought, but it was not so. As the F-104 burned, the fire truck could not produce any foam to put out the blaze. Scratch one beautiful fighter which melted right there on the taxiway. But I've mentioned only the rough spots. That's not totally fair and may give an inaccurate picture of the absolute magnificence of the performance, not only of the Arizona ANG but also of the F-104 we began to love. Yes, its radar was not as good as what we had in the old F-86. The gunsight was pegged as we had no computing sight since we had no gun. A five inch ballast weight was installed. But we were high and we were fast and Tom Delashaw and Ray Holt were showing the Soviets we were capable of 90000 ft!. It was a good show. Yep we learned to shoot the Sidewinder, the Aim 9, but it was also only the beginning model so it too had problems. My first shot was at a 5 inch rocket fired from the left wingtip. As it accelerated away, one of the flares on its fin broke off. My Sidewinder, looking for the first heat source, found the flare instead of the five inch rocket, and detonated almost directly in front of my aircraft! I flew directly through the debris. As it turned out, no damage was apparent, and the landing back at Wheelus AFB Libya was uneventful. I'll never forget the return trip through Pisa Italy where my flight leader, (then) Captain Don Owens and I stopped for fuel. Of course we had to visit the leaning tower. Back in Germany, we flew, had many successes, made a few errors, and as soon as it had begun, were on our way back to Phoenix. Well, I did not want to leave the F-104. I asked for and received what was called extended active duty. This meant, if selected, I could remain in the active Air Force and be re-assigned based on the needs of the USAF. As it turned out, I was re-assigned to George AFB California, home of the 479th Tactical Fighter Wing. I was assigned to the 476th Tactical Fighter Squadron which flew the F-104-C.
To me this was all new. Not only was a cannon installed, we had a real gunsight, and a centerline bomb rack that was nuclear capable. With 30 inch lugs, as opposed to the 14 inch lugs necessary for conventional weapons, I was suddenly in the bombing business. I had never dropped a bomb before. I had never fired a six barrel Gatling gun before, and I had never refueled in flight before. Talk about suddenly being thrown into the first team, I was ecstatic! We were briefed, taught, cajoled, convinced, watched, and written about. One of my first Officer Effectiveness reports reads, Lt. Vivian was one of my most improved pilots this reporting period. Talk about being non committal. But it was progress. We learned, and we became ready for the next task which was South East Asia and Vietnam. Because The U.S. was committed to the South East Asia Treaty Organization, our unit was placed on standby status in preparation for that deployment. We sat, flew refueling missions, fired at, and hit! The Dart. It was clear were to be in an air defense posture if we went to Asia. I chose to leave. Volunteer assignments were coming in regularly for duty with the South Vietnamese Air Force. We would fly with the VNAF in single seat Skyraiders, the A-1-H. I went to Naval Air Station Corpus Christi Texas for checkout. In no time I found myself leaving family, wife and children at George while getting ready to use this huge single engined eighteen cylinder fighter bomber equipped with fourteen bomb stations and eight hundred rounds of 20 millimeter to engage our opponent. No it was not meant to be agile, or accelerate, or even be fast. All of that was left behind. Now it was a manual bombsight, visual slant range, Kentucky windage and a pickle button. But it was amazing. Rewarding in its accuracy, when a worthy target was found, and reliable in that for every takeoff I made, I got at least one landing. We lost no aircraft save for a comedy of errors at Bien Hoa Air Base one day when incoming rockets and a bad parking plan, together with revetments made of tritonal filled bomb cases caused numerous Skyraiders and B-57 Bombers to be lost. A real fiasco. The report at the Command Center in Saigon was "Numerous aircraft going up in ripple". The problem was not our allies and their outdated Skyraider aircraft, or our fighter bomber efforts made up of F-100 and, at that time A-37 aircraft. It was totally our command decision to run the war from Washington. I cannot think of a single target that was struck that was not first provided approval from the Washington Military Command Center. Local commanders, who knew the people, knew the defenses, knew their area of responsibility, and knew what weapons would work!, were repeatedly overruled by the Washington idea, although dismal, of graduated increase in pressure placed upon the military efforts of the north by the Johnson administration and his Secretary of Defense Robert S. McNamara. I retch each time I think of the closeness of success and the singular reason for failure. In time. It was over. Having volunteered for duty in Vietnam, I received my choice of assignment coming home. It was a return to the F-104 and duty with the German Air Force Training Squadron at Luke AFB. I was assigned to the 4512th, and 4518th Fighter Training Squadrons for Flight instructor duty and with the 4516th Tactical Training Squadron as academic instructor. I was to teach school. I was going to heaven. The choicest of the choice. Under the direction of, (then) Captain Dirk C. Prather, Mr. Bud Stoddard, and (then) Col. Charles Pope. I taught F-104 systems--engine, hydraulics, and egress. There never could have been finer duty. Teach Academics in the AM, and fly an Air-to-Air, or Air-to-Ground sortie in the PM. Heaven! I worked closely with the German side of the house. After all, they were paying the bills. They bought the aircraft, and allowed them to be painted with USAF colors. Oberstleutnant Richard Eibl was in charge, and it was a pleasure to serve him and his country. As it turned out, the G was extremely capable, although heavier that either the A, or C. It had a Radar that neither the A, nor the C could compare with. It was equipped with a vastly superior flight control system with a REAL autopilot. The ground mapping portion of the radar coupled with a terrain clearance mode of the radar that really worked, was a pleasure. Actually, one could see a train on the railroad, and a reflector on the target pylon. Surprising radar bombing accuracy was possible. Lastly, the G model had real flaps! I mean real maneuvering flaps! I mean flaps to takeoff at 296 in the A model and 450 in the G model is a vast improvement! G available because of flap availability caused the G, even though heavier, to outmaneuver any dash three or dash seven equipped A model that ever existed. Dash 19 equipped models of the A are a horse of a different color, I should say thoroughbred 'cause very few of us had the pleasure of that combination. I stand by the point though, if only the engine was changed, I'm sure it was exciting. But if the flaps were not, the added G available in the Gustav due to the 450 down - 520 up flaps of the G was amazing. 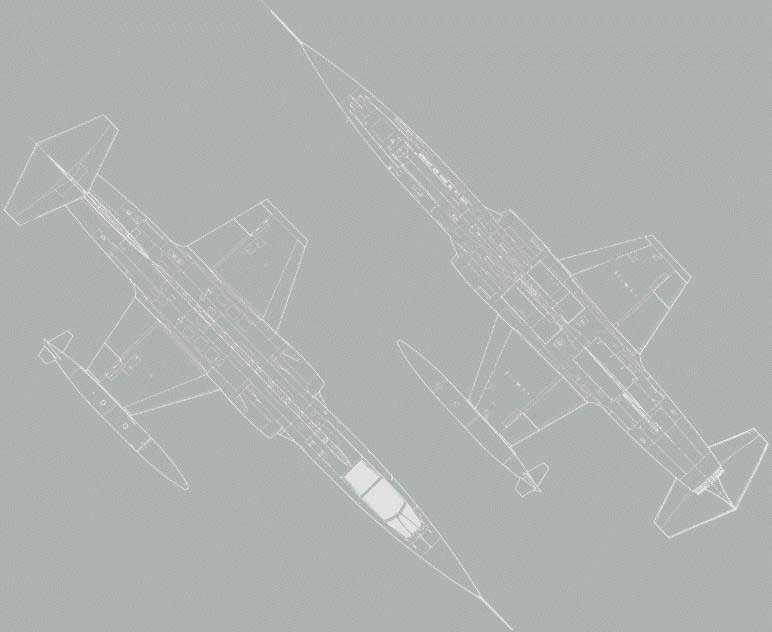 Additionally, for strictly political reasons, I must mention the Inertial Navigation System platform available in the MAP and G versions, in spite of its various problems, was a giant step forward in the technological sharpening of the fighter pilots ability to reach targets. I know people have been killed but without the necessity of revealing ones position thru Doppler radar (vertical measurement), the LN-3, although a first step, was huge in the improvement to visual methods of dead reckoning to targets in the eastern zone. From where I sat, in the QRA of my unit in Southern Germany, as I personally briefed, Herr Dr. Schlesinger on my targets, much to my chagrin ('cause I felt he had no need to know), a giant step in the ability to reach ones target, AND RETURN was most assuredly a part of my convincing him of my fighter bomber wings capability. And then came the realization that it could not last forever. Even though, through the assistance of Jürgen Stehli, Peter Müller, Jörg Kuebart, and Harry Liedke, I was able to go over two thousand hours in the F-104. These people all helped me in the realization of a goal that I had never dreamed ('cause one only dreams of such things). I could only stay in the F-104 as an exchange officer with the German Air Force or if I could get a follow on assignment to a headquarters assignment, perhaps Ramstein AB Germany. From there I could maybe get a return assignment to South East Asia, (you do remember we still had a war, excuse me, conflict, going on over there). I served my time in Memmingen, and departed (with both tears and a smile) to headquarters USAFE DOON, a division of USAFE charged with the responsibility to assure CINCUSAFE of NATOS ability to reach assigned targets. It was fun! Each week, Lt. Col. David Clardy and I would visit one of the various Air Bases which had been assigned the strike mission. Under the guidance of Allied Command Europe Directives 75-5, and 75-6, we would look at weapons, their loading crews and their ability to deliver. WOW! That meant flying the machines of ALL the nations! From South to North. Sometimes I didn't know where the shelter was. Sometimes, I couldn't find the shelter after the sortie. Some of the 'craft were clean, some had discrepancies. In the main I have never met more interesting, dedicated loyal countrymen. Many had no, or insufficient budget! Some had no heat, but they had fuel. ALL had a common desire to accomplish the NATO assigned mission. But what a learning experience. I will be forever grateful to all with whom I have flown. The young Turk who asked if I liked acrobatics, (yes) to the young Italian who said we will do acrobatics, yes, but only after we have reached the assigned target and returned to base. That is because, if we fall, we can fall on Government property. But it was time to leave. I had to leave my beloved F-104. After a short year in Korea, it was time for a retirement assignment. I chose to return to Luke AFB. It was my home of record. I could go there, work with the continuing training program for the German Air Force, and retire. I asked for a return to the academic squadron, became chief of academics, chief of the Flight test section. Worked with one of the most personable German officers I have ever met, at that time, Oberstleutnant Heinrich Thüringer and, at that time, Hptm. Horst Martin and Wolfgang Daberkow. These people, and folks like them, made up the strength, indeed the backbone of the Luftwaffe, in spite of what others may say. It was not those assigned 'auf der Harthoehe', (Ministry of Defense level folks). As it has turned out, Heinrich Thüringer, Gary Vance, Col Bud Jones and I flew my last ride at Luke in September 1982. I briefed and lead a four ship to the range. We dropped bombs, fired rockets, strafed, all old stuff for you new guys, but for me it was the magnificent culmination of an Air Force Career. My family met me on the ramp at Luke. David Bashow poured ice water all over me and someone handed me an open bottle of champagne. An Air Force Fighter Pilots Career. While it may not be interesting to all, it sure was a pleasure for me. From August 1960 'till September 1982 a total of 2815.7 hours in the F-104A, B, C, D, F, TF & G.